Fabulous prom dress ,evening gown CLX006 showcases a sheer bodice neckline, hole back ,a fitted mermaid silhouette completely embellished in immaculate beading work. The stunning crystals and pearls will make you shine and the talk of the evening! A dramatic choice for your social event, add gloves and a cocktail ring to complete this exquisite ensemble. Please choose the precise color before you place the order .Thanks ! Hand made of high quality tulle,sequins,beadings,jewels.The elegant bling bling dress will make you the shining star of the night! 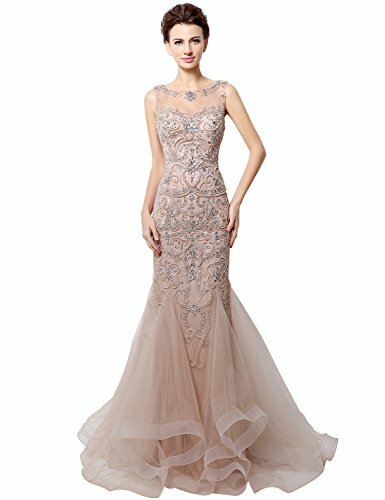 Long haute conture sheer bodice mermaid backless floor length prom dress ,suitable for evening party,wedding,dancing party,beauty contest and some special. occasions. Puffy tulle ,organza fabric with crystal beading ,lace appliques ,pearls and embroidery,conceal center zipper back. About Shipping:There are Two Shipping Method available,Expedited Shipping will need about 3-4 business days and Standard Shipping will need about 8-12 business days. If you have any questions about this product by Clearbridal, contact us by completing and submitting the form below. If you are looking for a specif part number, please include it with your message.